The potential to generate a continuous flow of innovative high-quality lollipops has been created by new ServoForm™ depositing technology from Baker Perkins. 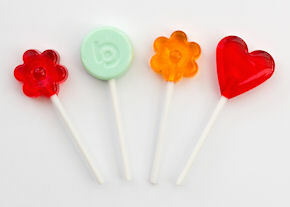 For the first time, interesting shapes, such as flowers and hearts, as well as the colours and patterns in the candy, can enhance the visual appeal of deposited flat lollipops. Embossing the surface is another new way of increasing the interest and variety of round or shaped lollipops. This continues Baker Perkins’ policy of expanding lollipop end product possibilities; totally spherical and conventional ball plus flat and 3D products are also available. The new capability brings character merchandising to the lollipop sector: connections to film, television, music and video game themes are now possible in the product rather than only the packaging. Seasonal ideas, typically for Christmas, Halloween and Valentine’s Day, can also be pursued. The ability to emboss enables an infinite choice of characters or designs to be added, either recessed into the lollipop or standing proud. Again, marketing or seasonal themes provide a rich variety of ideas. Because different products of the same outline can be produced without affecting the packaging operation, short-runs become economic. Baker Perkins ServoForm™ lollipop depositors handle up to four different components independently, right up to the point at which the product is formed, and this gives additional scope for end product variation. The selection includes clear products with hard or soft centre-fills; 2, 3 and 4 colour lollipops with stripes and swirls, plus side-by-side and layered products. An extensive array of flavour profiles adds even more potential to the blend of options to tempt the consumer - tastes support the visual attraction of the product, and provide new experiences. Baker Perkins ServoForm™ lollipop plants are totally automated from ingredient mixing to stick placing and ejection of the cooled product. Multi-functional lines for the production of flat lollipops and hard candies can also be supplied. As well as product variety, consistent high-quality is the reason many manufacturers choose depositing technology ahead of conventional die-forming. Superior appearance, high clarity, and rapid flavour release with a smooth 'mouth feel' are among the advantages. The nature of the depositing process creates complete control throughout the system, leading to extremely high dimensional, shape and weight accuracy with negligible scrap rates; plus maximum hygiene with low maintenance. Fast, automatic start-up and cleaning cycles have replaced time consuming manual operations. Priming the pumps at start-up and cleaning the pumps and hopper after every production run are essential, and are now carried out at the press of a button. The depositor head is raised and lowered, with purging and washout trays placed and withdrawn automatically. The cycles are pre-programmed and require no operator intervention.